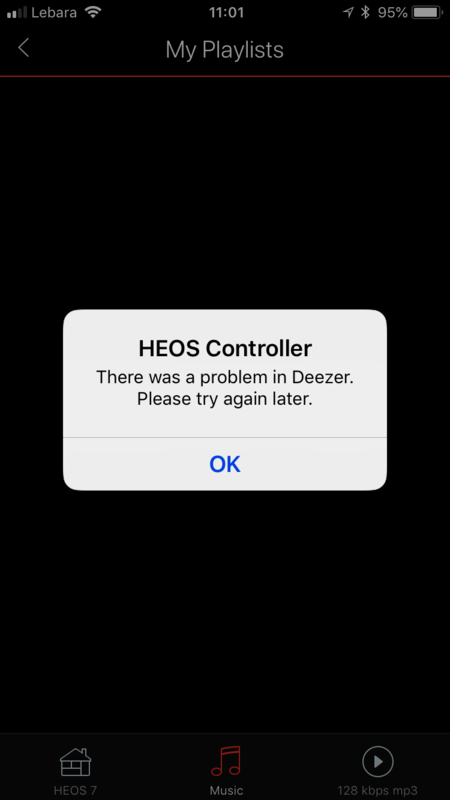 Hy i have a problem i can not open the deezer on my denon heos 7 , so far all was normal and now does not open. I tried all i have delited all aplications and started new and it is the same ? Hi there, please delete the app, turn you phone and the internet modem off for about 3 minutes. Turn everything back on and install the app again. Let me know if it helps! No it is the same i have done this two times . Hi there, sorry about that. Have you also tried to disconnect Deezer in the app and relink the account? Yes i tried that i dont no what else to do , because i buy this heos only for deezer. Can you find out which firmware version you're on? I am using iPad pro and iPhone 6 s on both i bave heos and Deezer application. The firmware is the software which the sound system has to be able to function - if Denon has an update for this, you should check it out here. Thanks but there is not my model only heos 5 to select?